This is a "WikiLeaks News Update", a news update of stories relating directly to WikiLeaks and also freedom of information, transparency, cybersecurity, and freedom of expression. "Prosecution Office Winterthur/Unterland wants to make the case that Swiss Bank Secrecy protects the data in the Cayman Islands and that based on a former employment agreement Swiss Bank Secrecy applies also to Rudolf Elmer working in the Cayman Islands. Prosecution Office wants to make the case that Swiss industrial secrecy laws also apply to the Cayman Islands in the case of Rudolf Elmer and accuses him of disclosing Julius Baer’s secrets on how it uses the operation in the Cayman Islands providing Trust & Company, Mutual and Hedge Fund services as well as the administering of Special Purpose Vehicles e.g. offshore companies of Carlyle, Washington D.C. within the Julius Baer Cayman office. Winterthur’s head prosecutor Dr. iur. R. Jäger requests an increased imprisonment from 8 to 12 months on probation, and newly a prohibition period of 3 years even though some complaints have been dropped at the Bezirksgericht Zurich. Dr. iur. R. Jäger concluded that punishment must be drastically increased. Dr. iur. R. Jäger argues that Rudolf Elmer is only out for revenge." Liberté info is accompanying the case and will post new developments on their website. Currently the appeal document is available for consultation. Rudolf Elmer, a former employee of Swiss Bank Julius Bär provided, in 2008, information to WikiLeaks exposing tax evasion in the Cayman Islands. candidacy and took pains to emphasize his support for U.S.
importance of maintaining a certain "constructive ambiguity"
standards and commending staff members for their dedication." "In my opinion we have become nothing more than a franchise of the US and Julia Gillard has traded my son for her position as prime minister... I’m going right to where the buck stops, which is Canberra, and I’ll be talking to people about this case. The only way we can get protection for our citizens — because if they won’t protect Julian, they won’t protect anyone else — is to let them know, so I’m asking the people to make November 17, not ‘celebrate Obama day’ but ‘support Julian Assange day’. (...) They’ve dragged us into so many wars that in hindsight were no good… There are many military and ex-military people [in the US and Australia] who are unhappy with the way the wars are being run… In fact, a veterans’ organisation called Stand Fast will be protesting in Canberra." * Various call to action and petitioning letters addressed to European organizations and Members of the European Parliament requesting action over the unjust treatment of Julian Assange in the context of the Swedish Prosecution Authority vs. Assange case have been compiled into a useful resource. Please take the time to read and send these letters, or to compose your own, and demand justice for Julian Assange and others affected by the same legislations and procedures. 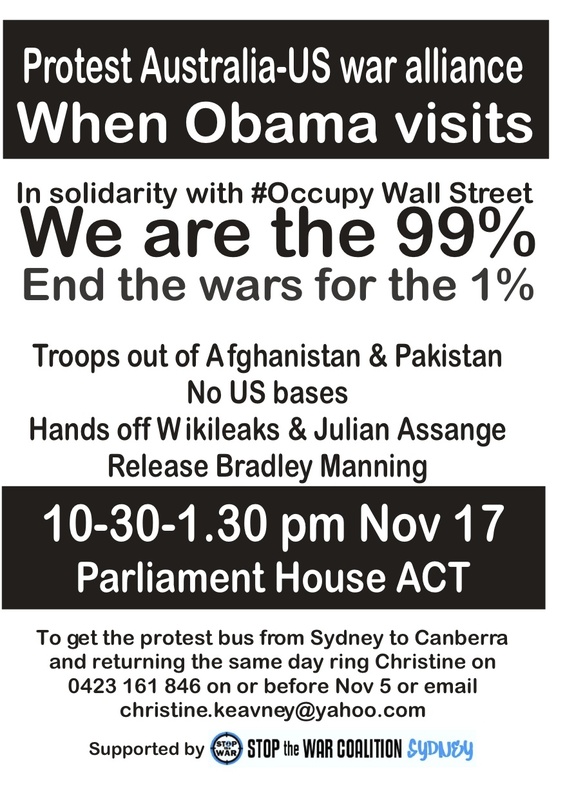 * November 17: Led by Christine Assange, Julian Assange's mother, a protest against Julian's extradition and US government actions against WikiLeaks will occur in front of the Parliament House in Canberra on the occasion of US President Obama's visit to Australia. Please join. Know more about this protest. * Online Human Rights petition demanding Julian Assange be protected by the Australian Parliament from extradition to the United States. The EAW has removed many of the traditional safeguards in the extradition process. If a court in one country demands a person’s arrest and extradition, courts and police in other countries must act on it. In 2009, this fast track extradition system was used to extradite over 4,000 people across the EU (700 people from the UK alone). Although it was intended to deliver justice, the current system is actually resulting in cases of serious injustice. Our own casework repeatedly demonstrates the human cost of EU extradition. Fair Trials International will continue to press for an EU extradition system which is both fair and effective. Through our Justice in Europe campaign, we are succeeding in making the case for reform. On the 17th of December - his 24th birthday - Bradley Manning will have been incarcerated for 571 days. On this day stand in solidarity with Bradley Manning whose only crime was revealing the truth - congregate at the White House, your city hall or town square, or your nearest US Embassy or Consulate - peacefully and solemnly. * Starting next Monday (November 14), a Call-in to The White House and Military to Demand UN Access to Bradley Manning will take place throughout the week. Additional information will be posted on the Bradley Manning Support Network website, bradleymanning.org.